A crew from the Britemoore gang showed up on the scene before to long. They were looking for Demetrius and everyone knew what it was about. Football. Jalen and D[emetrius] had been playing football when D stiff-armed Jalen. It was a bit hard for a pickup game, but no one was hurt. Still, Jalen had left and rounded up his older brothers, cousins, and friends in the britemoore gang to have a "conversation" with D who had wisely taken off, telling the group that he didn't want to cause any trouble for them. 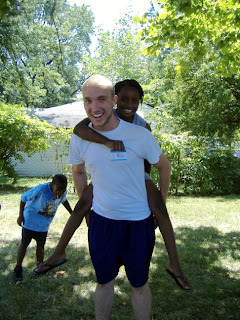 All at a backyard bible club led by students from Next Level Church. A different world? Maybe foreign, but the same sinfulness that leads 12 year olds to settle disputes with gang violence is the same sinfulness that runs through our veins. And not only do we share sin, but also the divine image of our creator. It was this sense of connectedness, coupled with months of prayer and planning that led a team of 9 students and leaders to Detroit, MI to bring a message of love to the children there. They scrounged up the money for the trip and took a week out of their busy lives to Give Themselves Away to people that they had been praying for, but had not yet met. And as always happens, God met them there. They worked for and loved and fed children that were desperate for love, and as a result 15 children prayed a prayer to follow Jesus. All because a team of people was willing to sacrifice to show God's love to people desperate for it. And in Giving Themselves Away the most curious thing happened. Instead of finding themselves empty, they found themselves full of joy, contentment, love, and relationship. You can't out-give God I guess.